Creston, BC is probably not what you first think of when someone mentions a grape growing and wine-producing region in BC. But it is. And it has a long history of orchard fruit production. I found this out on my recent trip to the interior. 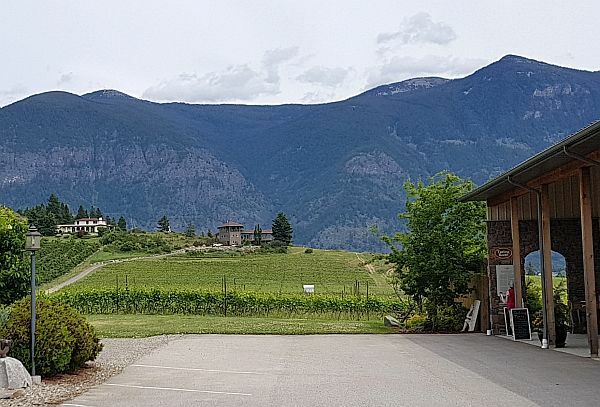 I knew that the Baillie-Grohman Estate Winery is located in Creston, and I know they produce very good quality wines, but I did not realize how similar this region feels to northern Okanagan. Aromatic white varieties are grown by Baillie-Grohman, which you also find growing in Kelowna northward. Notice in the map above, all the orchards planted around the winery? Baillie-Grohman started with the planting of grapes in 2007 and the production of their first wines in 2009. This region was not originally thought of as a grape-growing region, but with the changes in our climate the grape vines can survive the winters and get sufficient heat units to ripen grapes. It is not as hot as the south Okanagan, which is a desert. As I mentioned this area reminds me of the northern Okanagan. On the hills in the area, you see conifer trees growing in abundance. You may also notice another winery shown on the map above; Skimmerhorn Winery. I had not heard much of this winery but was told that this winery has been around for ~10 years more than Baillie-Grohman. There is lots of dedication in Creston by these wineries. Almost all the wines produced by Baillie-Grohman come from their estate vineyard around the winery. The exception is the Cabernet Franc which comes from a vineyard in Oliver, BC. Overall I was very impressed with the vibrancy of the fruit in all of the wines I tasted. My tasting notes about their wines follow below. Enjoy. Baillie-Grohman Récolte Blanche 2017 ($19) – this white wine is a blend of Pinot Gris, Schoenberger, Kerner and Gewürztraminer. It is very aromatic with vibrant stone fruit and grapefruit skin aromas. It is off-dry, soft, round, and medium bodied with harmonious acidity. Stone fruit, pine needles, and grapefruit rind flavours. Tasty. Baillie-Grohman Gewürztraminer 2017 ($21) – Medium minus intensity aromas of lychee, grapefruit, and some greenness. Medium minus body, round and slightly off-dry. Medium acidity. Lychee, juicy fruit gum, and light pine needle flavours. Mouthwatering finish. Baillie-Grohman Blanc de Noirs Rosé 2017 ($20) – This wine is made from the Pinot Noir grape, and the colour comes from 30 hours of skin contact before fermentation. The wine has a delightful orangey salmon colour. Nice strawberry and rhubarb aromas. Medium body, semi-round, and medium acidity. A floral component was quite prominent, followed by flavours of red cherries, strawberries and salty minerality. Tart red fruit finish. Tasty. Baillie-Grohman Pinot Noir Terraces 2014 – Their Pinot Noir grapes, are grown on their estate, along with the white varieties I’ve discussed as well. The Pinot Noir block is located on the east and west slopes at the top of the hill beside the owner’s house. This wine as well as their rosé wine I noted have a salty mineral aspect. Their winemaker, Wes Johnson, son of owners Bob Johnson and Petra Flaa, told me that their soil is glacial till, but I think there may be limestone mixed in the soil or deeper in the soil profile where the Pinot Noir block is planted. This wine is light translucent garnet in colour. It has aromas of sweet red fruit, vanilla and bramble. Medium minus body, dry with a hint of salty minerality, which gets stronger at the finish. Floral, tart red fruit, red cherries, bramble and light pepper on the palate. Sweet spices on the finish. Nice. You can browse and purchase their wines through their website. I did find a small selection of their wines at EverythingWine. Save On Foods has a wide selection of BC wines at several of their stores, but I cannot see which wines they carry. I would guess that Baillie-Grohman would be there. Swirl Wine Store in Yaletown has a great selection of BC VQA wines and I assume Baillie-Grohman wines would be here as well.